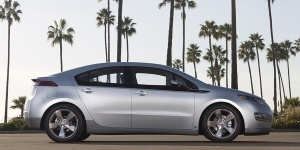 The 2013 Chevrolet Volt benefits from a number of new packages and an upgraded audio system with navigation. The Comfort Package includes heated front seats and leather-wrapped steering-wheel, while the Safety Package 1 and Safety Package 2 add parking sensors, rear vision camera, forward collision alert and a lane departure warning system. Find the used Chevrolet Volt of your choice from a dealer in your area. Search our used car listings now.